Most modern cruise ships are marvels of engineering that leave cruisers in awe, but for many passengers, the sea itself has a thrilling allure all its own. That explains why many new vessels have incorporated breathtaking ocean views via lounges and suites with panoramic windows, outdoor dining and entertainment areas, see-through water slides and even glass-walled pods that rise high above the uppermost decks. 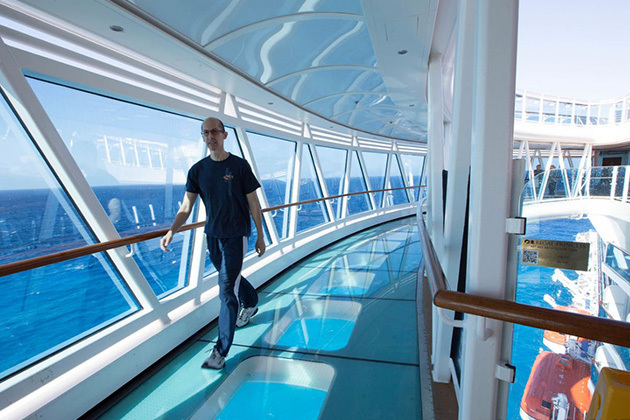 Adding to the laundry list of ocean-centric features is the SeaWalk on Princess Cruises. The SeaWalk is a 60-foot-long enclosed glass hallway that juts out over the side of the ship, allowing those walking on it to watch the ocean glide by 128 feet below them. On ships that have it, it's located on Deck 17, starboard. Although it can be difficult to get decent ocean views after the sun goes down, the SeaWalk is open 24/7; despite the fact that it's enclosed, you might want to avoid it if you have a fear of heights. The SeaWalk is found aboard Royal Princess and Regal Princess. 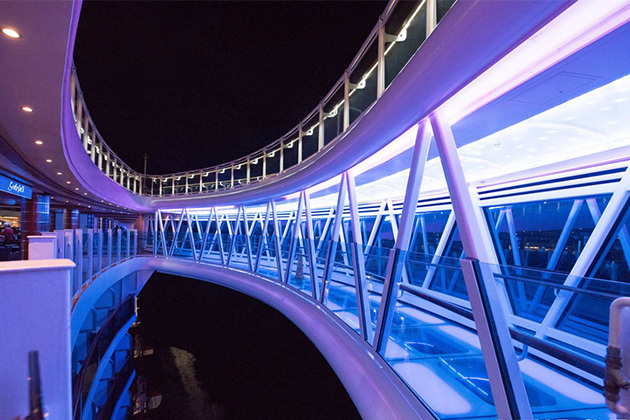 View pictures of the SeaWalk on Regal Princess.